The ABK bench scale delivers reliable performance with industrial-strength durability. A large backlit display with checkweighing limit lights helps streamline shipping and reduce data entry errors. Ideal for industrial settings, GBK checkweighing scales are the answer for businesses needing heavy-duty durability and speed. The WBZ washdown retail scale features durable stainless steel housing and IP-66 rated waterproof housing, making it ideal for processing, preparing and packaging food. The backlit display provides weight, price per unit and total cost. Simple to use, the Raven price computing scale is perfect for grocery stores and commercial retail environments. The Raven offers 40 PLU memories, which are accessible directly from the keypad for quick product recall. Latitude compact bench scales deliver an excellent value for weighing, checkweighing, percentage weighing, and counting. The battery operates for up to 240 hours, so there are no worries about losing power. Adam Equipment offers a wide selection of products to tackle a variety of duties in food-related industries. 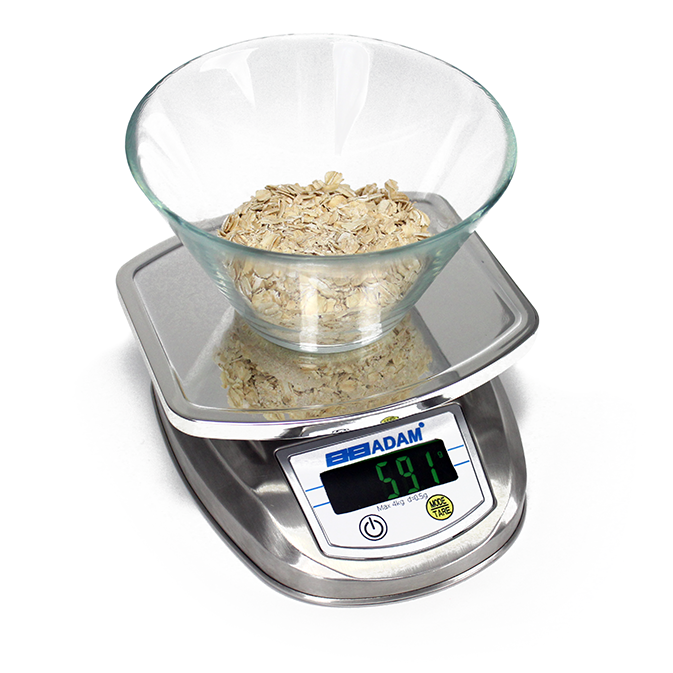 Testing, processing, production and service tasks can be performed with ease using Adam's food scales and balances. In retail or deli settings, Adam's approved price computing scales can provide digital readouts visible to both the user and customer. Food processing and production plants rely on Adam's durable washdown scales. These durable food-grade scales are IP-rated for batch and recipe preparation, and are ideal for quality control weighing needs. Approved scales are suitable for filling containers, packaging by weight, or checkweighing. In food QC labs, Adam balances are used in recipe creation and sample weighing, while our moisture analyzers efficiently and quickly assess the moisture content in foods. Adam's easy-to-use scales are well-suited for food service applications in franchises and restaurants. Our scales precisely measure ingredients, making them ideal for maintaining portion control and to ensure product consistency. Food industry professionals worldwide turn to Adam for weighing solutions that deliver speed, performance and value.